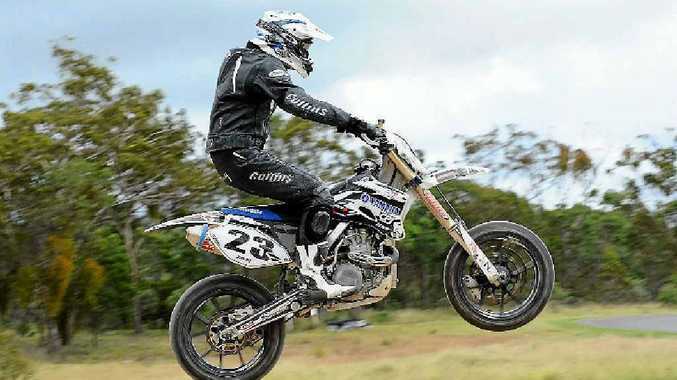 GLADSTONE Super Moto rider Chris Jones has become the first local to take out the Queensland series, winning the Clubman Class. After leading into the second of two rounds, Jones was not able to dominate the Mareeba weekend as he did in the first round in Stanthorpe but his fourth place finish was enough to clinch the overall title. "I ended up with one first, two seconds, two thirds, a fourth, a seventh and an eighth place in the races," Jones said. "I consolidated in the last couple races after bad starts, finishing was enough to win overall." The Gladstone club had four representatives at the second round, including Chris' brother, Tony, who crashed in an early race and was unable to continue for the remainder of the weekend. Colin Leadbetter was able to finish on the podium for the round, in third sport, while fellow rookie Simon Moore claimed seventh. Jones now turns his attention to the Australian titles in September, a one round challenge held in Proserpine.